SECAUCUS, N.J., April 8, 2010 – Tina Charles, Monica Wright, and Kelsey Griffin were selected with the first three picks of the 2010 WNBA Draft presented by adidas. The Connecticut Sun selected the University of Connecticut’s Charles with the first overall pick of the draft. The Minnesota Lynx then used the second and third picks to draft Wright from the University of Virginia and Griffin from the University of Nebraska. The Chicago Sky selected former Rutgers star Epiphanny Prince with the fourth pick, and the San Antonio Silver Stars chose Stanford’s Jayne Appel to round out the first five selections. Before the first round ended, Griffin was dealt to the Sun in exchange for Connecticut’s first and second round selections in the 2011 Draft. The Sun would ultimately grab four of the first 15 selections, taking Danielle McCray of Kansas with the seventh pick and Allison Hightower of LSU with the 15th pick. 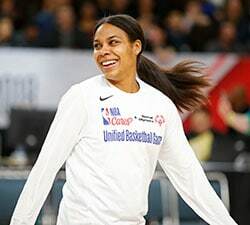 Charles enters the WNBA after earning All-America honors while leading the University of Connecticut Huskies to their second consecutive NCAA Championship and a record 78 straight wins. She wrapped up her college career as UConn’s all-time leader in scoring and rebounding. 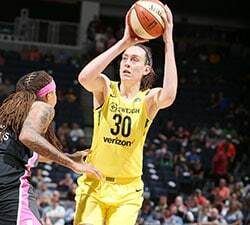 While it marked the first time in franchise history that the Sun held the top pick in the draft, it was the third time in WNBA history that the No. 1 overall pick came from New York City’s Christ the King High School (Chamique Holdsclaw—Washington Mystics, 1999, and Sue Bird—Seattle Storm, 2002). It also was the first time in WNBA annals that the No. 1 overall selection had been traded prior to the Draft. 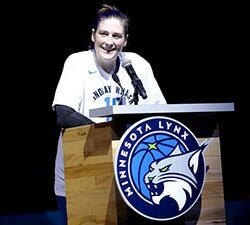 Connecticut obtained the pick earlier this year when it sent Lindsay Whalen and the second overall pick to the Lynx in exchange for Renee Montgomery and the top selection. Few players led their collegiate teams as completely as did Wright, who led Virginia in scoring, minutes, rebounds, assists, field goals made, three-pointers made, free throws made and steals. In Minnesota, Wright will join a superstar whom she has looked up to for some time. One of the few centers in a guard-heavy draft, Appel joins the Silver Stars after leading Stanford to three consecutive Final Four appearances, including the most recent one in San Antonio. Chicago head coach Steven Key was extremely pleased to add the playmaking Prince to the Sky roster. Prince, who spent what would have been her senior year overseas playing in Turkey for Botas-Spor alongside the Sky’s Courtney Paris, was equally excited to being going to the WNBA and Chicago.